Dimensions H x W x D 49" x 12" x 12"
Zu Audio has been around for just over a decade, fairly young by any standard. In that short time they have managed to make a bit of a name for themselves, mainly around their loudspeakers and modified Denon DL-103 phono cartridges. A few years ago they scrapped their entire line of speakers, and started with anew - with the Essence as the first in the revised series. This model design is centered around a 10.3" paper cone driver which runs with no crossover in it's path, and a stated frequency range from 30Hz to about 10kHz. The frequencies above 10kHz are covered by a ribbon tweeter. The cabinet is a boxy looking 12" by 12" column, and features something they call Griewe cabinet loading. The full-range driver has been revised from its previous incarnation with a stronger motor and stiffer, heavier cone. Also a new phase plug for in an attempt to linearly manage high frequencies and broader dispersion. 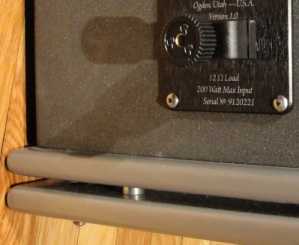 A Tang Band Ribbon tweeter handles treble duties above 10khz. The cabinet is vented on all sides at the bottom. A metal grill is also available, but not something I would use, just for aesthetic reasons alone. I can only wonder about the possible sonic impact of a metal grill with a fairly thick guage mesh, it is easy to imagine the mesh obstructing and reflecting sound. I was not able to listen to the effects since the grilles were sent after the listening tests were completed. The Essence sports a fairly unique feature, something they call the Griewe technology. It consists of a 36" high foam pyramid that is 9" wide at the base, affixed to the inside base of the cabinet. Co-founder Adam Decaria explained that the primary objective of this technology is to reduce cone excursion, which makes the electrical impedance more linear, and that should reduce distortion. The pyramid also absorbs higher frequencies, which is an unrelated benefit to the primary objective. Adam said, the technology works by mainly controlling back wave pressure on the cone, the pyramid further controls/mitigates what little backforce exists. I cannot say that this explaination of the technology was digested by my non-technical brain, Adam also admitted that it was not easy for them to explain the technology either. He did say, that they are spending time and effort on studying the technology further and trying to explain how it works. But technology, is not the end to itself - so on to the proof. In my preliminary listening sessions, I found these speakers to be quite impressive. A nearly full range frequency response, nuanced and detailed presentation, and high sensitivity requiring not much in the way of grunt from the amplifier upstream. But I have never felt comfortable passing judgement without direct comparisons to competing products. Given the price point, a reasonable comaprison could be made to my longtime trusty Dynaudio Contour 1.3 MkII; although the two come from fairly different schools of thought and therefore one should expect inherent differences between the two. But, while I acknowledge that expectation I do also take it lightly - since in the final analysis all competing products need to deliver, period; being from a different school of though cannot be an acceptable excuse for a shortcoming in performance. As usual, the methodology consisted of level matching the two speakers and alternatively listening to very short segments, that usually focuses on a single aspect, till a difference is clearly and repeatably noticed. The Zu reproduced the full depth and breadth of the double bass; replete with the ability to rattle loose objects in my room. At least as of the requirements of this track, it is fairly evident that the Essence needs no assistance from a subwoofer. Decays were clean and free of slop. Extension was a bit deeper than what the Dynaudios could deliver and a bit more natural and relaxed sounding, that is quite the acomplishment for the Zu right there. The Zu's were not as cohesive in their presentation of the piano as the Dynaudio, key to note here is that the scale of difference in performance is very small and I would perhaps not have noticed this had I not been doing direct comparisons. The individual drivers in the Dynaudio are incredibly well integrated and the handoff from one driver to the other is almost impossible to discern, even when your ears are within a foot from the speakers. During my comparitive tests I noticed that the Zu's seemed to not be as well integrated, and sounds from the tweeter could be distinguished from those of the woofer, even during a piano solo. I believe that sitting further away than the 8' from the speakers that I had placed myself, should provide a better seeming integration between the drivers. I would certainly see these speakers do very well in a much larger space than my 12' by 20' space. The Zu's presented male vocals with a more open and effortless delivery. The Dynaudios in comparison sounded a tad constrained, I could not tell if that was the effect of the Zu's having a less intrusive cabinet design or the lack of a crossover on the main driver - I'd suspect the latter. Again, an impressive performance by the Zu's. At times it seemed the Zu's had a smidge more detail, but I cannot be very sure - what differences I perceived were too close to call. I often use this outstanding track as a test for treble performance, I'd have to call it a tie with the possibility of the Zu having a slight margin in it's favour. Now that is quite saying something, especially given the direct comparison to the Dynaudio's venerable D260 tweeter. This is my favourite Oscar Peterson album, but alas is not very well recorded. The cymbals on this track sound splashy, muddled and even hurtful to the ears. This negative aspect was slightly more noticeable with the Zu's. I would not characterize the Dynaudio as having a forgiving or shelved down treble response, but the Zu's seemed to exacerbate the issue. In my overall experience, the treble response of the Zu's was always very detailed, but a bit fatiguing at times - but that is the signature of metal tweeters in my experience. I have generally found metal tweeters to have some level of excessive detail or even harshness - of course, the extent is greatly dependant on the implementation. They are often great at detail, but often can eventually become fatiguing. As long as your listening sessions are not terribly long, loud or your recordings are not of poor quality in the treble, you should be okay. I have also generally found that metal tweeter excel at low listening sessions, where you want to get alot of the detail without playing loud. For me, the limitations become apparent when the volume increases. Having said that - I must say that the metal ribbon in the Essence is as well executed as I have ever seen. The other instances of really well executed metal tweeters are the Totem Acoustics Model 1 Signature and the Tonian Labs TL-D1. On this track female vocals were equally detailed and fluid on both speaker. The Zu's again did seem a bit more open and effortless in comparison to the Dynaudio's slightly constrained presentation. I would not have picked that difference if I was not doing direct comparisons. 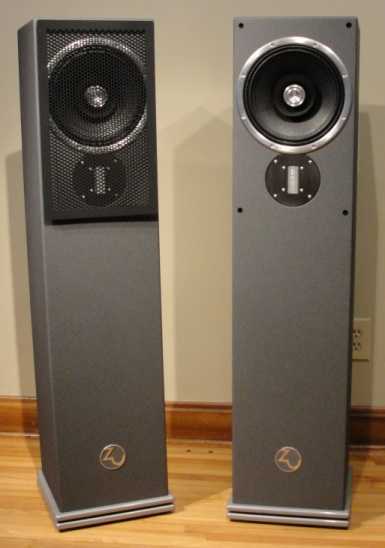 I emerge from my time with these speakers having not dissapointed the fairly high expectations I had at the start. Stack all the accomplishments of these speakers and you have a pretty impressive list - excellent bass extension and that of high quality too, an openness and speed in the mid and bass regions that is to covet, excellent dynamics both in the micro and macro realms, great detail in the treble [even if to a fault with poor material], and if all that was not enough then throw in the speaker's high sensitivity and you have a winning combination. On the negative side, I cannot say I am terribly beguiled by the aesthetics and the tweeter has it's minuses as is characteristic of metal ribbons. But, there are plenty of people I know who prefer the attributes of metal ribbons, and swear by them. They actually tend to be sensible and matured folk, who listen to music at low volumes and lean toward high quality recording and ancillary gear. These speakers are a definite must for those folks, and it would also behoove those not already in that club to give a listen. Quite an achievement.